Globe Telecom has recently partnered with Formula One racing team Lotus F1 Team as it introduces its new and modern network, which has recently rolled-out 100% 3G coverage nationwide, with full 4G HSPA+ footprint by end of third quarter this year. This will give subscribers a faster mobile browsing experience in the age of smartphone revolution. 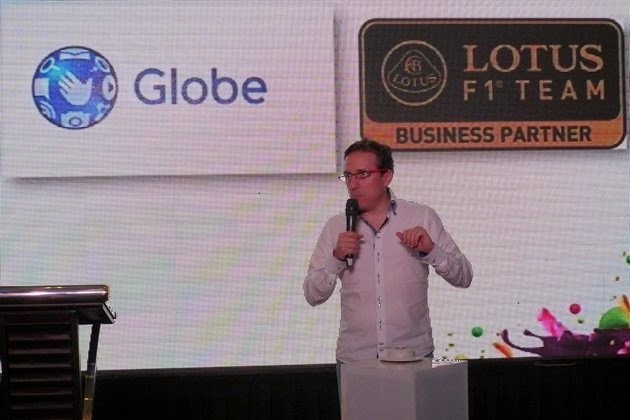 With the partnership, Globe becomes the exclusive business partner of the Lotus F1 team in the country and telecommunication partner of Filipino-Swiss Marlon Stockinger, the first Formula One racer to have placed the Philippines on the F1 radar. Stockinger’s impressive track performance, particularly his first place finish at the Monaco leg of Grand Prix 3 Series in 2012, earned him a spot in the Lotus F1 Junior Team. He and six other promising drivers joined the Junior Team in February 2013 to undergo rigorous training that will boost their wellness and performance on their journey to competing in Formula One races. Currently, Stockinger is competing in the Renault World Series, a major step towards qualifying for F1 events. To celebrate the partnership, Stockinger will fly to Manila on August 30, 2014 to lead the Globe Speed Day at the Bonifacio Global City (BGC) in Taguig. The event will feature Stockinger showing off his track skills driving his Lotus-Gravity Charouz Formula Renault 3.5 race car around BGC. It is also set to be packed with thrill and excitement as Lotus F1 simulators, booths, freebies, and games in partner-establishments around BGC await racing aficionados. Globe Telecom is the first telecommunications company in the Philippines to achieve 100% 3G coverage for its entire network, providing its customers with high-speed wireless internet for faster data interchange on their mobile devices. The telco also expects to fully equip its network with the more advanced 4G infrastructure with the HSPA+ technology by end of the third quarter this year, allowing customers to enjoy faster data connectivity even as they use bandwidth-intensive multimedia data applications such as video and photography.